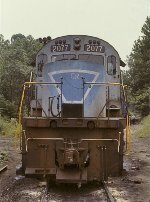 Description: CR C-420's 2073(ex-L&HR 23) and 2077(ex-L&HR 29) together at the Bethlehem roundhouse in August, 1977. Description: CR C-420 2077(ex-L&HR 29) takes a rest at the Bethlehem roundhouse in August, 1977. Description: With CR C420 2077 behind, LV SW8s 273 and 264 idle beside the Bethlehem turntable in August, 1977. Description: Former L&HR C420 2077 (L&HR 29) prepares for work at the Bethlehem roundhouse. Description: Former L&HR C420 2077 (L&HR 29) is out of the roundhouse and waiting for assignment at Bethlehem. Description: Former L&HR C420 2077 (L&HR 29) waits for assignment with RS11 7641 at Bethlehem. Description: Former L&HR C420 2077 (L&HR 29) and ex-LV RS11 7641 wait for assignment at Bethlehem.